If it takes a village to raise a child, we have our own community raising this play! The “Circle of Deceit” community is growing by the day, and we would love for you to join it. 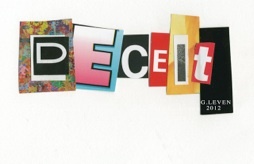 Click on the link below, to see how Deceit’s Circle is expanding. Join and show your support, by making a contribution! You may also contribute directly via PayPal. We had an amazing fund-raising event on November 18th at Emerging Artists Theater. About 65 people came and enjoyed food, wine and beer and soft drinks, and then were treated to four scenes from the play read by our cast - to give a flavor of the work. The reading was followed by an interview with the playwright and director, who then took questions and comments from the audience. The producer, and host, Carol Dudgeon, recognized those responsible for pulling the evening together as well as for their on-going fund-raising. She thanked those who have already contributed to producing Deceit, and asked those who hadn’t to please do so. And, thus the Circle grows….